Here are some best practices for collecting and caring for the colorful masterpieces. Even a practical display can be quite pretty! 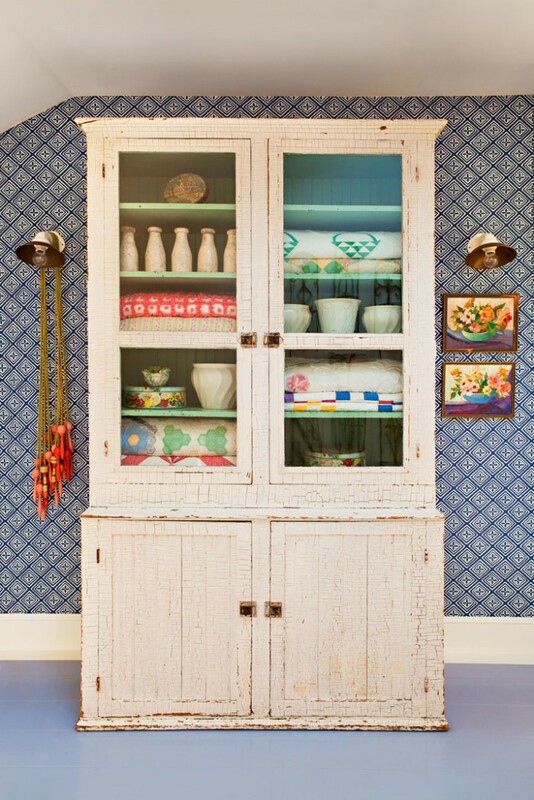 The glass hutch allows the colors and patterns of usable quilts to be on display when they’re not in use. To hold an antique quilt is to hold a piece of history. In days gone by, women gathered to create these beautiful masterpieces to use in their own homes and to give to others. Perhaps made for a wedding or in preparation for a coming baby, quilts told stories of life and time. Today, we love them for their color, intricacy and history. If you’re just beginning to collect these textile masterpieces, it’s good to know what you’re looking for and why. 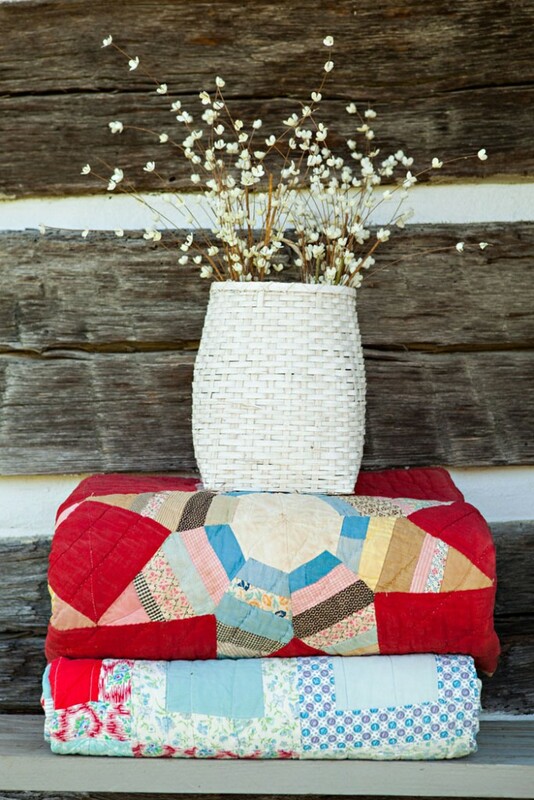 Do you simply want cozy quilts that catch your eye and fill your home with warmth? Or are you looking specifically for certain patterns and styles from different points in history? If the former, buy what you love! If the latter, be sure to educate yourself on the tips and tricks of the business before spending big bucks on something that isn’t exactly what you think it is. There are too many reproductions on the market to start buying without a thorough understanding of what is and isn’t authentic. Quilting books, groups and experts can help you on your quilt collecting journey. Different colors and color schemes were popular in different eras, and may offer clues to the item’s age. Quilts that are at least 40-50 years old are considered vintage while any creations over 100 years old are antiques. Different styles and patterns have been popular at different times. Hand or machine stitching can also give clues to a quilt’s age and value. When examining a quilt, look closely at the stitches, if they are slightly uneven in size and spacing, it was probably hand sewn. If the stitches are nearly identical, it was probably made using a machine. When buying, whether at an auction or online, be sure to look closely for quality quilts in good condition. Just because a quilt is old doesn’t mean it should be in poorly kept. Rule number one in quilt cleaning is that if there is any damage to the quilt, refrain from washing it until repairs have been made to prevent further harm. Experts say that if you can avoid washing your quilts, you should. Gently vacuuming with a hose can be an effective substitute and will rid your quilt of excess dust. Place a fiberglass or nylon screen between the quilt and the vacuum hose for safety. If the quilt is particularly delicate, brush the dust off using a soft paint brush and then simply vacuum away the pile of dust. Use and collecting are two totally different categories when it comes to quilts. However, those who love to cozy up in these big blankets with a cup of hot chocolate and those who hold these pieces behind glass can both agree that quilts are always a work of art! If you do need to wash the quilt, first check for colorfastness. Using a wet, white washcloth or cotton swab, rub it against the different fabrics of the quilt. If there is any color transfer to the swab or washcloth, don’t wash the quilt. If however, there is no color transfer, wash the quilt by hand. 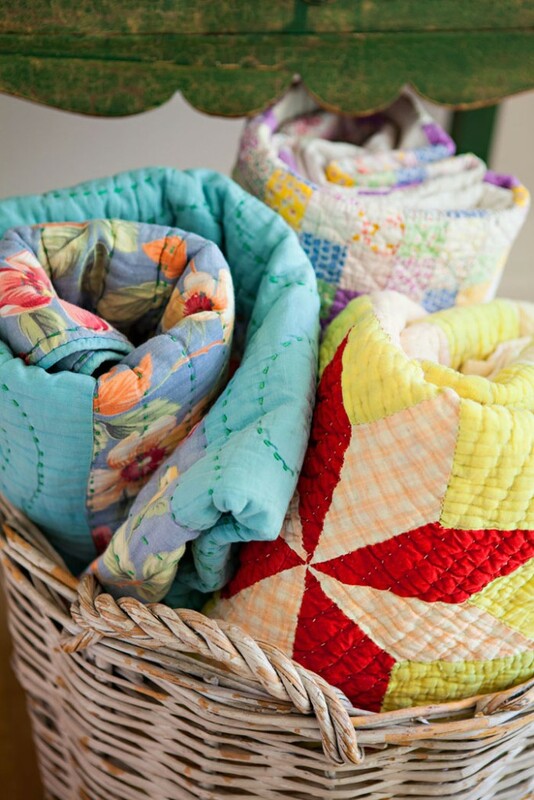 Never dry clean your vintage or antique quilts as the chemicals used in the process can damage the fabric. Only machine wash the textiles if you are confident about the sturdiness of the quilt holding up against the agitation of washing machine, but be aware of significant risk for damage, especially if the quilt is old and delicate. Wash: Fill your bathtub up with cold water and add a gentle and dye free detergent. One well-known recommendation is Orvus Soap which can be found at feed stores. While wearing gloves, gently swish the quilt around in the water and detergent, leaving it in the water for at least ten minutes before emptying the tub and refilling it to begin the rinsing process. Rinse: Empty and refill the tub until the water and quilt are soap free. Another recommendation is to add a 1/2 cup of vinegar to the water rinse. When pulling the quilt out of the tub, don’t pull out a single corner or edge as the heaviness of your water laden fibers can cause rips or tears; rather, lift the whole thing out at once using both arms. If it helps, use a white sheet to make a sling and allow the excess water accumulated in the quilt to drain. Dry: Dry quilts by laying them flat somewhere indoors. If you choose to dry them outside, make sure the quilt is not placed in direct sunlight, as this will cause the fabric to fade. To safely dry indoors, place a piece of plastic, topped with a layer of towels, between the quilt and the floor or mattress you will be laying it across. If you can, aim a room fan in the direction of the drying quilt for increased air circulation. Treat newer quilts with care and they can last a lifetime. Store and Display: The quilt must be completely dry before storing. If you’re folding the quilt and placing it somewhere to store, let it dry for an additional 24-48 hours to be sure there is no excess moisture hiding inside. Displaying quilts, by hanging or laying them flat on a spare bed, will over time result in wear. It’s a good idea to rotate your collection through storage and display to prevent potential wear and decay. To store safely, place acid–free tissue paper in the folds to prevent permanent creases. Don’t store your quilt in wood or plastic, but rather cotton muslin bags or boxes made specifically for archival storage. Don’t keep quilts in the attic or basement where mildew and temperature levels cause damage. If you must keep them in plastic or wood, wrap them well with acid free paper. To prevent permanent creases, take the quilt out once a year to air and refold, and don’t stack multiple quilts on top of each other.